As a dermatologist or office manager, you understand that there is a direct correlation between the proficiency of your staff and the efficiency of your daily workflow. You also know just how difficult it can be to find nurses and medical assistants who possess the unique educational skill set needed to excel in our specialty. Satisfies Meaningful Use “Credentialed Medical Assistant” requirement. CLICK HERE to learn more. Increased efficiency. Even newly-hired staff can learn how to assist with complicated tasks such as iPledge registration. Providing training to newly-hired staff at less cost and in less time. Our program provides 16 hours of review spanning more than 35 different dermatology-specific topics. You simply will not find a more affordable training solution anywhere. Increased safety for your patients through a properly-educated staff. As an example, click here to watch our “Antibiotics” module in which we review proper antibiotic use and potential side effects. Patient safety is emphasized throughout the program. Trusted Content. Dermatology practices across the country have chosen us as their resource for staff training! Ensuring accountability through testing. Employers enrolling their staff will have full access to staff member test results. No risk. We’re so confident in the quality of our program that we offer an unconditional 30-day money back guarantee. Our e-learning modules provide practical, real-world dermatology knowledge written specifically for the nurses, medical assistants, CNAs, and dermatology “techs” who provide clinical support to dermatologists throughout the country. The program is delivered entirely online and is therefore accessible from anywhere an internet connection is available. Level I focuses on the “essentials” of what everyone working in dermatology should know. Topics reviewed include dermatology anatomy, collecting and documenting dermatology-specific history, skin cancer, introduction to dermatology coding, a complete review of common dermatological medications, plus more. Level II goes “beyond the basics” with reviews of the most common dermatological lesions, rashes, and conditions. Most common labs, procedures, and even principles of cosmetic dermatology are reviewed as well. Each module has a corresponding quiz which must be passed with a score of 75% or higher in order to receive credit. The quizzes may be taken at a comfortable pace (up to one year to complete) and may be repeated if necessary in order to achieve a passing score. After successfully completing and passing all module post-tests, enrolled individuals are instructed to provide an evaluation form to their supervising dermatologist**. The supervising physician will be asked to confirm that the staff member has demonstrated satisfactory knowledge of the various concepts covered in this course. In addition, individuals must also demonstrate proficiency in the practical job skills which simply cannot be taught through video modules. These skills include tasks such as prepping patients for procedures, handling of surgical instruments, practicing universal precautions, etc. 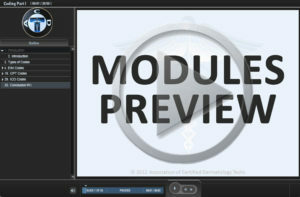 Even those brand new to working in dermatology may complete the video modules and post-tests. However, there is simply no substitute for on-the-job experience. Before we grant full certification, supervising physicians will also be asked to confirm that enrolled individuals have acquired at least 6 months of full-time (or 1000 hours of part-time) experience working as an assistant in clinical dermatology. Staff members who are currently working in dermatology have probably already acquired this amount of experience. Those who are new and can’t yet fulfill the experience requirement may still complete the course and earn a provisional credential (see here for more information). Users have up to one year from the date of enrollment to fuflill the above requirements. Upon their completion, we will grant the enrolled individual the credential of Certified Dermatology Tech® (CDT). This certification is valid for 2 years, at which time recertification will be necessary in order to maintain use of the credential. *Those who attain only a “Certificate of Completion” may later earn full certification (at no extra cost) if any remaining requirements are subsequently fulfilled within 1 year of passing initial testing. **Supervising dermatologist is defined as a practicing dermatologist who is currently board-certified, or eligible for certification, by the American Board of Dermatology (ABD), the Royal College of Physicians and Surgeons of Canada, or the American Osteopathic Board of Dermatology (AOBD). A midlevel practitioner (PA/NP) may serve as your direct supervisor provided he/she in turn works in practice with a qualifying supervising dermatologist. Exceptions may be made on a case-by-case basis for those working in dermatology practices outside of the United States and Canada. Please contact us for more information. ***Those who haven’t yet acquired the full 6 months or 1000 hours of experience may earn provisional certification in order to satisfy the Meaningful Use “credentialing” rule. See here for more information. Additionally, please note that the CDT credential is intended to represent proficiency/experience in the general clinical dermatology setting. Those whose job duties are particularly specialized (e.g., UV techs, scribes, etc.) may not qualify and would instead receive a “Certificate of Completion” only.